In this lesson, we are going to learn how to fix the Azure Remote Desktop Connection error. Recently, I got several requests from my students regarding the Remote Desktop connection issue. Earlier, it was very easy to connect to our cloud computers using RDP, but in the updated Azure portal, it is quite difficult to connect to the Remote Server using RDP. So now, we are going to troubleshoot this RDP issue. Log into your Azure account on the Azure Portal using https://portal.azure.com. In the portal, I have already installed Server 2016, named “Server”, and we need to connect to our Server through RDP, so click “Connect”. On the right side, you can find the “Download RDP File” button under the “Connect to virtual machine” option. Before you download, you can select the IP address - you can connect via Public IP address or if you are using VPN connection, you can choose Private IP Address. Then, select the port number as “3389” and click “Download RDP File”. So, our RDP connection is downloaded. You can find the RDP file named “Server.rdp” on the bottom of the page. Click the “Server.rdp” file and then click "Connect". 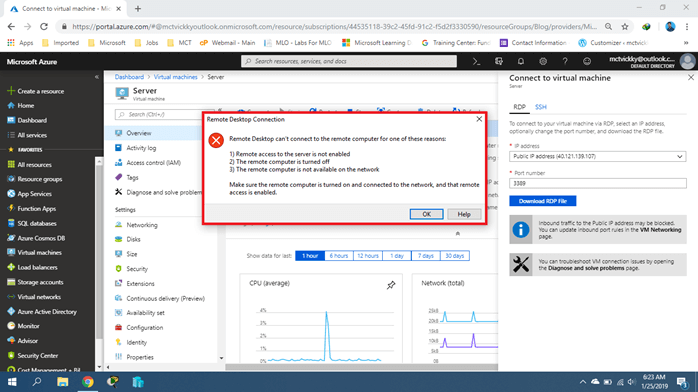 Yes, now, you can find the error message, i.e., “Remote Desktop can’t connect to the remote computer”, but your Server is running and the Remote Desktop connection is turned on, so click “OK”. Before you download the RDP file, you need to add the “Remote Desktop Port Number”. By default, it’s not configured under the networking. 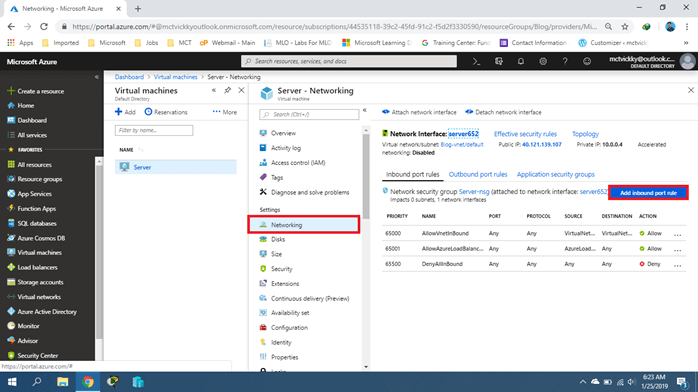 On the Virtual Machine page, click “Networking”. 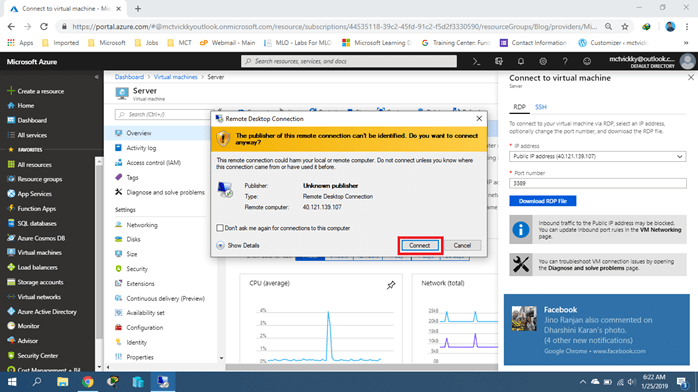 Now, you can see there is no inbound port rule for RDP connection, so click “Add inbound port rule”. 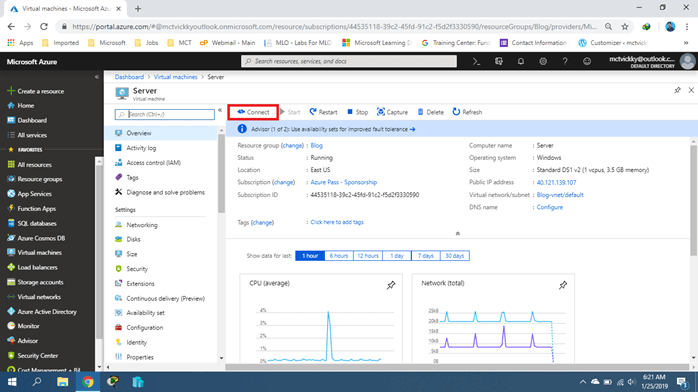 In the "Add inbound security rule" page, enter the port number “3389” on the destination port ranges, and change the name like “Port_3389” or "Remote Desktop Port", and then click “Add”. 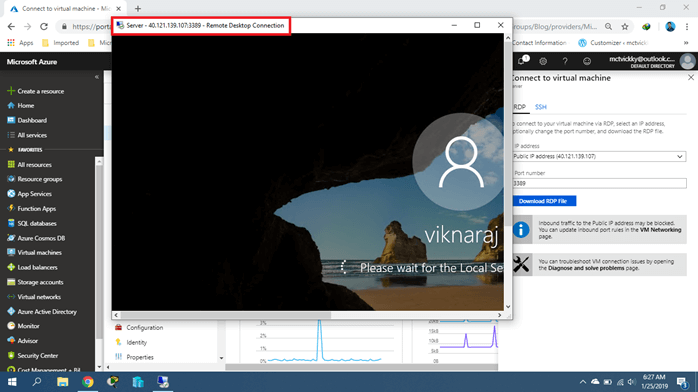 Again, click "Connect" and download the new RDP file, or you can use your existing RDP file to connect the Remote Server. Now, you will get the Remote Server response window. Here, enter your username and password. Then, click “OK”. In the Certificate pop-up, tick the “Don’t ask me again for the connection to this computer” checkbox and click “Yes”. Now, you can access your Cloud Server using Remote Desktop Connection. In this article, we learned how to troubleshoot our Azure Remote Desktop Connection. I hope you have found this article helpful. If you have any questions, feel free to comment.